When you take the amp of standby, the amp hums... pretty noticeably. I'm running at low volumes (around the first hash mark), which is PLENTY loud for practicing/recording in a smaller area, but the hum is so loud that its annoying. If I turn the amp up, the hum does not increase with the volume of the amp, so I am assuming its not a tube problem. Any ideas? or is this just how they sound when they are 'on'? My AC-15 doesn't have this same sort of 'powered up' sound. You may have a bad power tube or a grounding issue in the power amp. It's tough to say without hearing it. All tube amps hum, some more than others. But if it's annoyingly loud, regardless of gain and volume settings, that isn't right. What sort of guitar do you play? My AD30 hums a very little with my Tele, but is silent with humbuckers. You're not getting stuck in some sort of ground loop, or have plugged into a circuit with lights or dimmers on it? Incidentally, if you haven't had the chance to, do open up that volume dial when you can. Sounds an awful lot better! Does it hum with no guitar plugged in? It has nothing to do with the guitar... as it does indeed hum without a guitar plugged in. 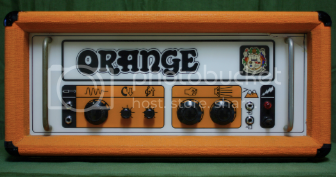 Its not a typical "single coil" type hum... its a low "pitched" hum. It does get a little louder as I turn things up... I was just testing it right now. There are no dimmers on the circuit that it is plugged into. Sounds like there's a bad ground conection somewhere. There's so many spade connectors in that amp it's pretty possible one of them isn't making good contact. Its also plausible that there's a bad filter cap in the power supply, but probably not. Have it looked at...your amp is under warantee, mind as well use it. Possibly a spade connector, but we've never come across an AD30 spade problem here I think (guys?)... I usually associate a buzz with bad grounds rather than low hum. Maybe. Have you tried it out in different places, and also tried swapping the preamp valves? I have not tried swapping any tubes as of yet... I wasn't sure if it was 'notmal'. I've determined however in listening to some of the clips on the 'official sound clip' thread, that the noise isn't present on other's recordings of the same amp. Its definitely not a buzz... its a low hum.. pitched to a particular note even. It makes this hum even with gain and master volumes set to nothing and no guitar plugged in... would that alleviate it being a preamp tube? I could probably post and example of the sound if it would help. Incidentally - probably a silly question, but i'll ask anyway - you are using correct speaker cable to plug it into the cab, rather than a guitar cable aren't you? Yep.. using an actual speaker cable... and a high quality, short one (under 3 feet) at that. 16 ohm cabinet... plugged into the 16 ohm jack. Its definitely under warranty... I bought it on October 7th (3 weeks ago). <br />I have not tried swapping any tubes as of yet... I wasn't sure if it was 'notmal'. I've determined however in listening to some of the clips on the 'official sound clip' thread, that the noise isn't present on other's recordings of the same amp. Its through the speakers unfortunately... turns on and off with the standby switch. Jim, OK this is really begining to sound like a filter cap problem! As it's Under Warranty, return for Warranty Service. Do it now!